The Spring 2018 Catholic Studies Lecture at St. Scholastica will examine how the Benedictine model can be applied to environmental stewardship. Sister Anne McCarthy, OSB, will speak on "Climate Crisis and Benedict's Model" at 7:30 p.m. Thursday, April 12 in the Mitchell Auditorium on campus. The event is free and open to the public. Sister Anne will explore how Saint Benedict's model of humility, community and prayer can guide and inspire both reflection and action in the midst of a climate crisis. Sister Anne coordinates Erie (PA) Benedictines for Peace and is on staff with Benetvision and Monasteries of the Heart. She participated in the Nonviolence and Just Peace Conference in Rome in 2016, which was co-sponsored by the Pontifical Council for Justice and Peace and Pax Christi International, and she is active in the Catholic Nonviolence Initiative. 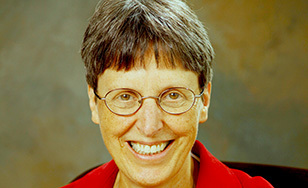 Sister Anne leads retreats on nonviolence and feminist spirituality and holds an MA in Theology in monastic studies from St. John's University, Collegeville, MN. She is on the board of the international Monastic Interreligious Dialogue. She lives at Mary the Apostle Catholic Worker House in Erie, PA. The Braegelman Program in Catholic Studies at The College of St. Scholastica explores the Catholic intellectual tradition with students and the larger community. All of its events are open to the public and free of charge.